It's Friday, it's the weekend, and it's a HOLIDAY weekend at that! Not a REAL holiday, you say? any excuse for a party is my philosophy. and there's no reason to say 'I just don't have what I need to throw a party'... because you DO! so invite the neighbors over this weekend, and celebrate! play perfectly off of each other to create a 'South of the Border' mood. * a burlap shopping bag covers a blue plant pot [it's pretty, it just didn't fit the color scheme!] * bright yellow faux flowers from the 'fall' decor box in the garage add color punch the marigolds in the pot are real, the yellow mums are faux, and the ivy was cut from a wall and tucked into the pot. better to have a full arrangement for impact than a few spindly marigolds! 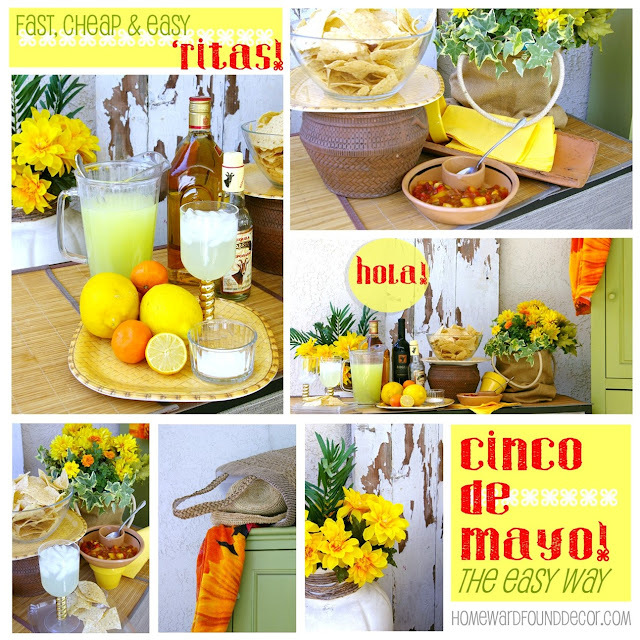 * A big basket lined with a garbage bag and filled with ice could hold Coronas next to the bar Now, for the 'Fast, Cheap & Easy'TM way to make Margaritas! I came up with this one years ago, when my bar supplies had dwindled. I had tequila. And I had lemons. SO, I improvised and created 'Cheater 'Ritas' - and discovered that this simple version is just as refreshing as the complicated drinks! * Run the cut lemon or orange across the rim of the glass, then dip the glass into the salt. Add ice. * Pour a shot [more or less] of tequila into the glass over the ice. * Pour lemonade into glass to fill. * If desired, slice up a lemon and orange, and place a slice on the rim of each glass. Now this is certainly no 'Cadlillac Margarita' for connoisseurs, but it is a refreshing, cool libation that is a quick treat to make with what's on hand, and it's CHEAP and EASY to serve for crowds.